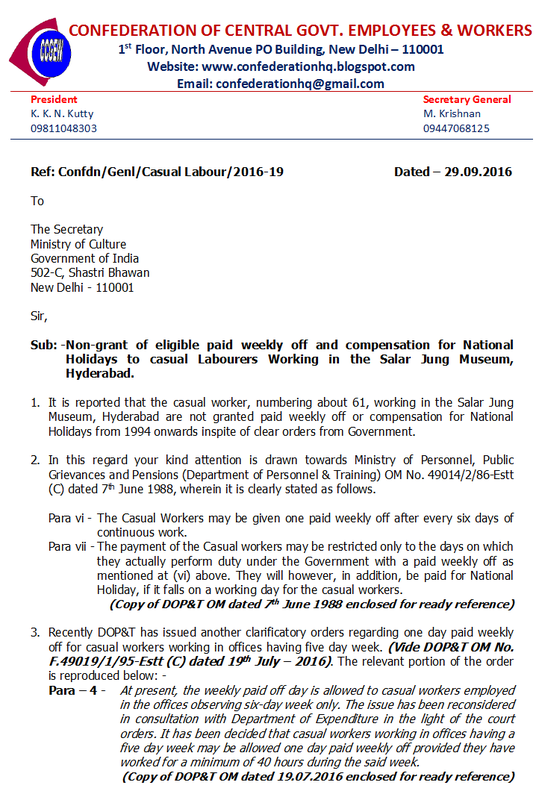 Non-grant of eligible paid weekly off and compensation for National Holidays to casual Labourers Working in the Salar Jung Museum, Hyderabad. Bonus payment is an extra payment given for doing one's job well also known as performance-related pay or pay for performance. 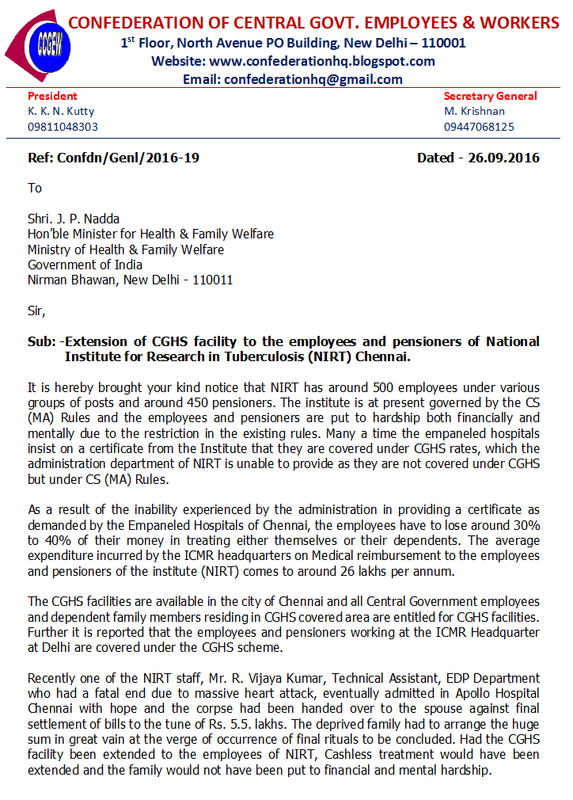 Extension of CGHS facility to the employees and pensioners of National Institute for Research in Tuberculosis (NIRT) Chennai. 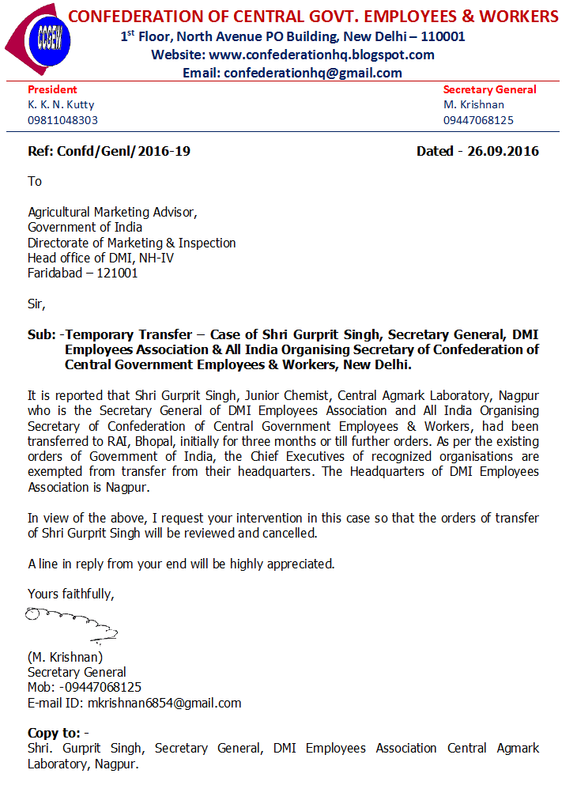 Temporary Transfer – Case of Shri Gurprit Singh, Secretary General, DMI Employees Association & All India Organising Secretary of Confederation of Central Government Employees & Workers, New Delhi. 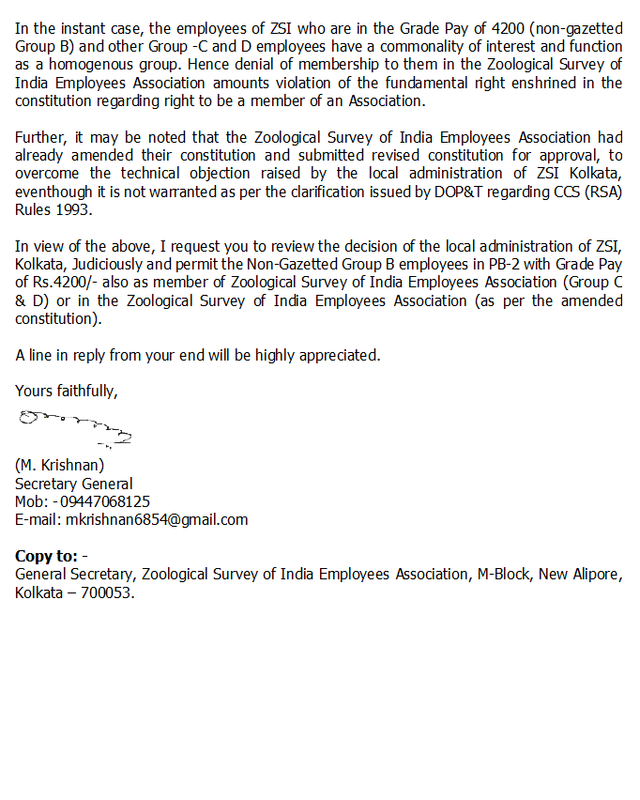 Continuation of the union membership of the employees having grade pay of Rs. 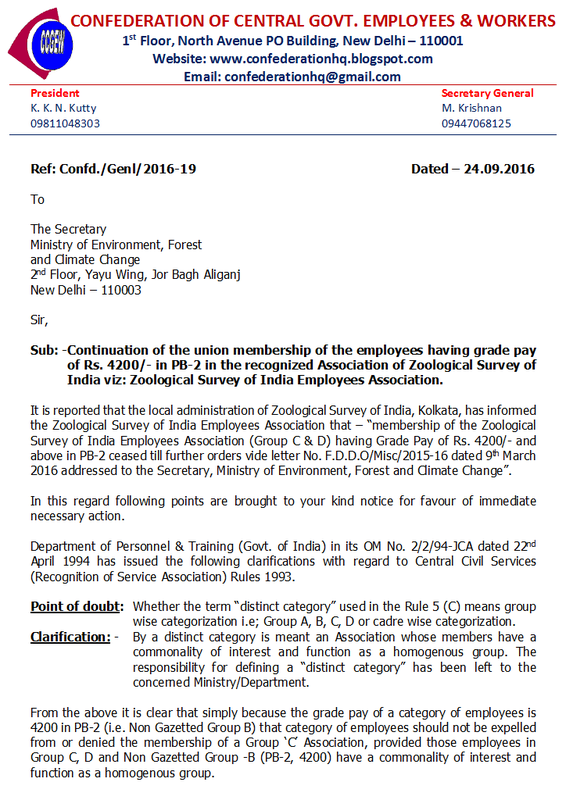 4200/- in PB-2 in the recognized Association of Zoological Survey of India viz: Zoological Survey of India Employees Association. Implementation of recommendation of 7th CPC – Fixation of Pay and Payment of arrears in respect of - (a) Autonomous organisations (b) Central Government Employees who are working in Autonomous bodies on deemed deputation. 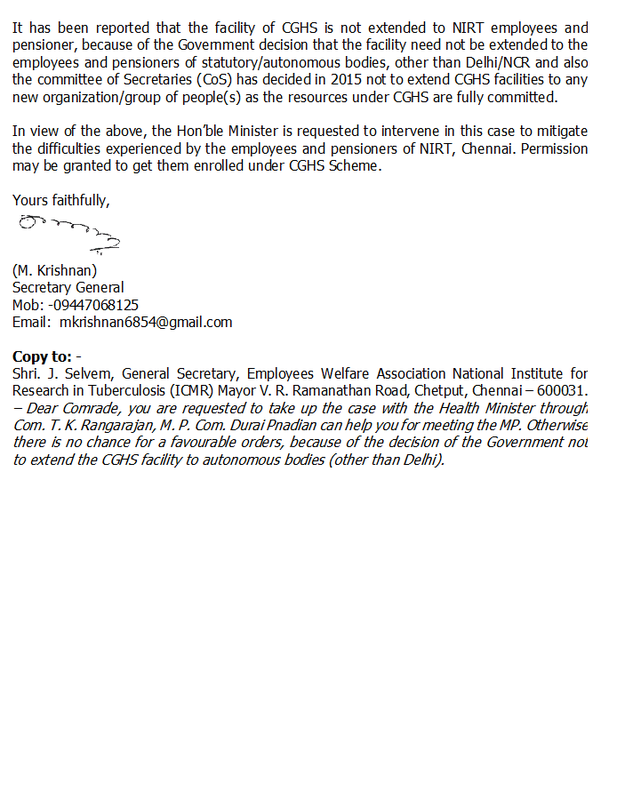 It is hereby notified that the National Secretariat meeting of the Confederation of Central Government Employees & Workers will be held on 30thSeptember, 2016 (Friday) at 10.30 AM at NFPE office, New Delhi (North Avenue Post Office building). All CHQ office bearers of Confederation and Women Sub Committee office bearers (not women sub-committee members) are requested to attend the meeting in time. The following shall be the agenda of the meeting. 1. Review of the 25th National Conference of Confederation held at Chennai from 16th to 18th August 2016. 2. Review of the National Women’s Convention held at Chennai on 17th August 2016. 3. Review of the 2nd September 2016 General Strike – Campaign conducted and percentage of participation of membership in the strike in each organization/State. 4. Review of the progress made in settlement of NJCA Charter of Demands including increase in minimum wage and fitment formula as per assurance of Group of Ministers. 5. Finalization of dates and charter of demands of Confederation for implementing the agitational programmes decided in the 25th National Conference. 6. Issues relating to the affiliated organisations. 8. Any other items with permission of the chair. CONSTITUTION OF CONFEDERATION AS AMENDED BY THE NATIONAL CONFERENCE HELD AT CHENNAI FROM 16TH TO 18TH AUGUST 2016. Central Government employees under the banner of Confederation of Central Government Employees and Workers, observed September 19th as “MARTYRS DAY” at many places. On 19th September 1968, entire Central Government employees went on nationwide strike for one day, demanding Need Based Minimum Wage, unanimously approved and recommended by the 15th Tri-partite Indian Labour Conference held in 1957. The Central Government banned the strike declaring as illegal and promulgated Essential Services Maintenance Ordinance (ESMO) and military and para-military forces were pressed into action to sternly deal with the strike. 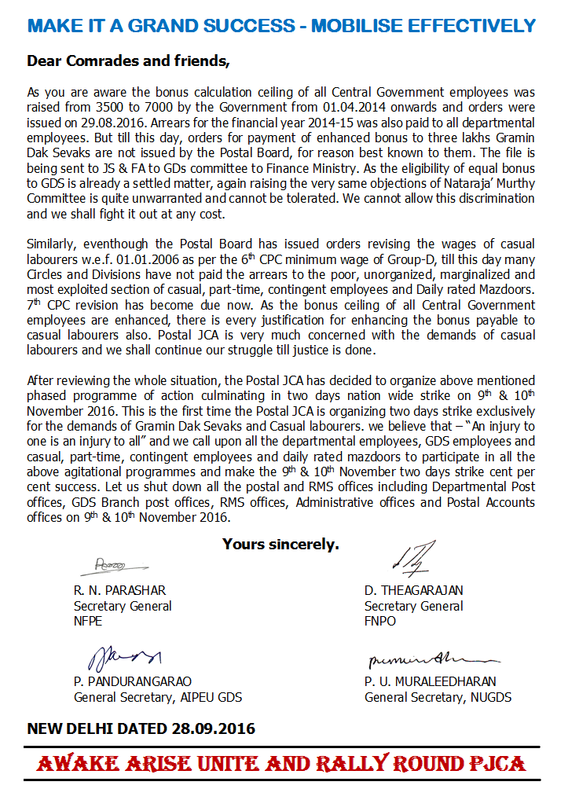 Inspite of all these, about 36 lakhs Central Government employees participated in the strike. Thousands of employees were arrested and sent to jail. More than 40,000 (forty thousand) employees were suspended, dismissed, terminated from service, chargesheeted and transferred to far off places. Government unleased brutal repressive measures including Lathi charge and firing against the striking employees, at Pathankot, Bikaner, Jorhat Assam, Indraprastha Bhawan Delhi etc. Seventeen Central Government employees were murdered. We are observing every year September 19th as Martyrs Day, remembering the greatest sacrifice of seventeen comrades and paying respectful homage to them. T.NARASIMHAN, National Vice -President, CCGEW. 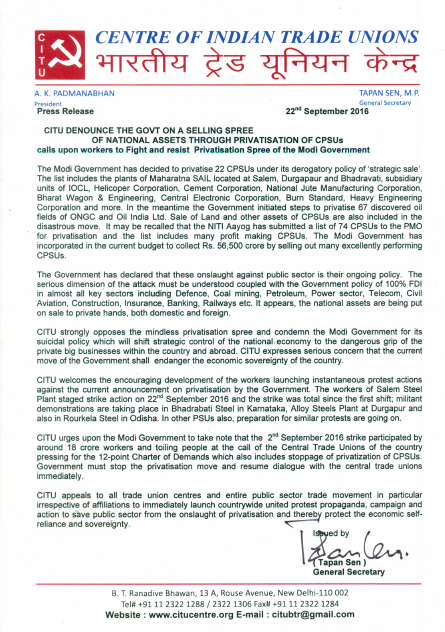 The working class of the country expressed its strong protest against the pro-corporate, anti-Labour and anti-people policies of Sri Narendra Mode Government at the center through its nationwide strike conducted on 2nd September. Whereas about 15 crore workers and employees participated in the strike of 2nd September last year the number of participants went up to about 18 crores this year. 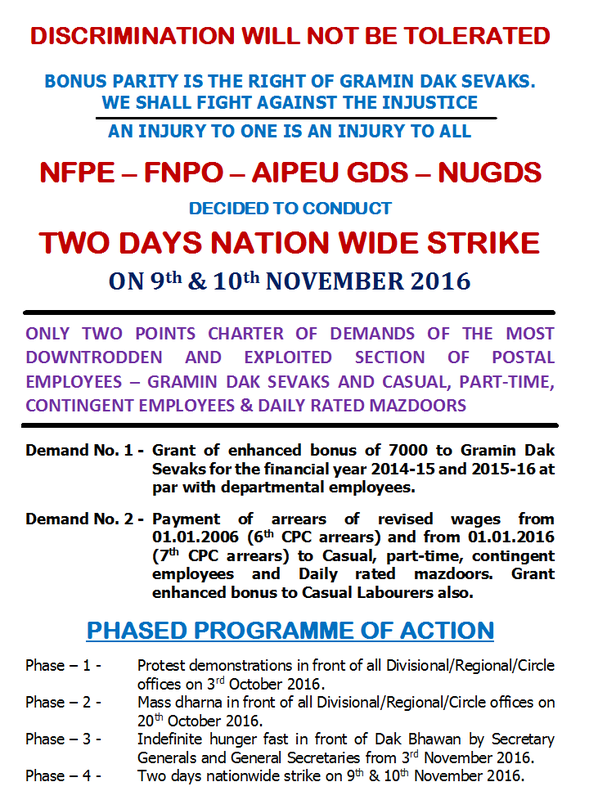 The present strike is being considered to be the biggest among all those so far conducted in independent India. In spite of several attempts by the ruling B.J.P. Government at the center and its trade union B.M.S. to prevent the strike through false propaganda and deception the working class did not yield and registered its strong resentment against the retrograde measures of the Modi Government. Though the Union Labour Minister, Sri Bandaru Dattatreya endeavoured to attain self-satisfaction by stating that the strike was not much effective, the statements of many a federation of trading community which made it clear that the strike resulted in a loss of about 18,000 crore rupees to the nation belied his statement. 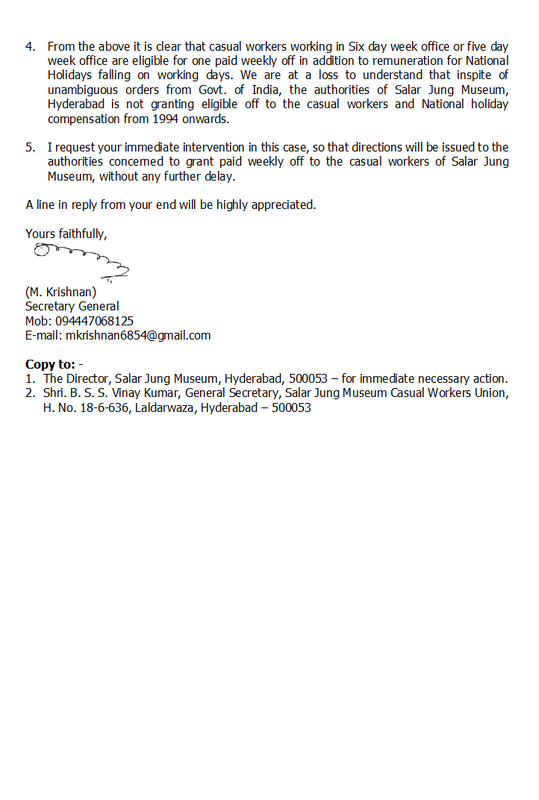 The minister's home state, Telangana, itself was severely affected. All transport organizations, both public and private, including state run R.T.C. and autos stayed off the roads and an atmosphere of bundh was witnessed. The coal manning in Singareni Collieries which spreads over four districts of the state came to a grinding halt. Many industries in and around Hyderabad downed their shutters because their work force joined the strike. The public life in many states came to a standstill due to total strike in their transport systems. Kerala and Tripura experienced a state of complete bundh. Many workers who are not affiliated to any organisation in several industrial areas of the country also took part in the struggle. The workers and employees of many key sectors in the country like Banking, Coal, Oil, Insurance etc., and many public sector undertakings including B.H.E.L. completely struck work. The Modi Government is often asserting that the working class has lost its primacy in the country and the stage is ready for the corporate sector to take over. It is earnestly wishing that the fruits of new economic policy which is being pursued for the last 25 years should entirely go only to the corporates. All the moves of the present government are only in that direction. The Modi Government is emphasizing that the working class does'nt require any protection and its duty is only to produce wealth through its hard labour without aspiring to any profits, as was preached by Lord Sri Krishna in "Bhagavatgita". Government providing 'Z' Class security to Sri Mukhesh Ambani, the country's foremost billionaire and 'Y'Class security to his spouse are to be viewed in that light. 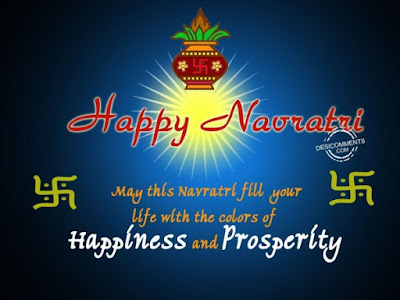 On the occasion of celebrating the 70th Independence Day all the customers of B.S.N.L. in the country received a message from non-other than the Prime Minister Sri Modi on 15th August with his greetings and an appeal to listen to his Independence Day speech that was going to be delivered from the ramparts of Red Fort on that day. The people who listened to it attentively were surprised. Even the Chief Justice of the Apex Court of the country publicly expressed his dissatisfaction over the speech. The judiciary, which has been hitherto turning a deaf ear to the loud cries of the country's intelligentsia, working class and the unemployed that the reforms which are being implemented for the last quarter century are drastically reducing the employment opportunities in the country, is itself feeling the heat of the reforms now. The Chief Justice was critical about the Prime Minister's silence in his speech on the large scale vacancies in the judiciary which are affecting quick dispensation of justice to the needy. Recently a survey conducted on the economies of various countries in the world declared that India occupies 7th place in the list of wealthy nations. The N.D.A. Government patted its back on this report. The rulers declared that their policies alone elevated the country to that position and the propaganda of the working class that the country is falling back is not at all true. A country, 50% of whose population falls below poverty line or just above it occupying 7th place among wealthy nations! How ridiculous!! The Prime Minister while addressing a seminar in New Delhi recently remarked that some people are still hanging to the out dated theory of 'Capital and Labour' of the 19th century and are trying to infuse it even today. He further commented that in the background of changing economic environment of the world Labour is losing its predominance and technology is to step into its place. However, the Honorable Prime Minister should clearly understand that no country can progress economically in absence of 'Capital and Labour'. He should recognize that without Labour capital alone cannot create wealth and so he should respect the value of Labour power. But unfortunately the central government is found lacking in this respect. The 2nd September strike is a result of such an attitude. Similarly, the Prime Minister's Red Fort address was remarkably mum on price rise which is a serious problem that is being encountered by the people every day. There was also no mention of this strike of the working class and its demands. But it was unfortunate that his speech referred to the working women of the country in a belittling tone. He declared that the existing laws would be amended to enable all the malls, huge shops, bars, clubs and pubs remain open 24 hours a day and allow women to work during nights. In this context one should not lose sight of the fact that our country is one among those where security to women is at its least. There is strict condition in U.S.A. which insists that if a woman works in a club during nights somebody who is close to her should also be on duty in the same club during that period. The Prime Minister should have consulted Mr. Obama, the President of U.S.A. who recently turned out to be his close friend, on this matter. The P.M's. foregoing remarks about working women exhibit how scant his respect to them is. The Modi Government came to power in 2014 on the strength of 'Swadeshi' and 'Bharat Matha ki Jai' slogans. But it is not lagging behind its forerunners in pursuing the policy of 'Videshi' from day one. The only difference is that the previous governments put the country on sale in retail market whereas the present government put it to sale in wholesale market. It is selling away the public properties at very low prices to the corporates and multinationals by inviting F.D.Is. into Defence, Railway, Banking, Insurance, Telecom, and Retail sectors as well as public sector undertakings. The patriotic working class of the country went into the 2nd September strike with an aim of protecting the public properties. It is unethical to divert the pension funds which provide social security to the employees and workers, to private investments. Same is taking place in National Pension System. The N.P.S. enables the pension funds to be diverted to speculation business comprising of mutual funds, equities and other share market transactions and makes the employees to face its consequences. The longevity of life of employees and workers is being considered a burden by the government. The Ex-M.Ps. and Ex-M.L.As. who were in saddle for just 5 years are being paid lifelong pension. After they cease to exist their wives are paid a monthly pension of about Rs.25,000/- . 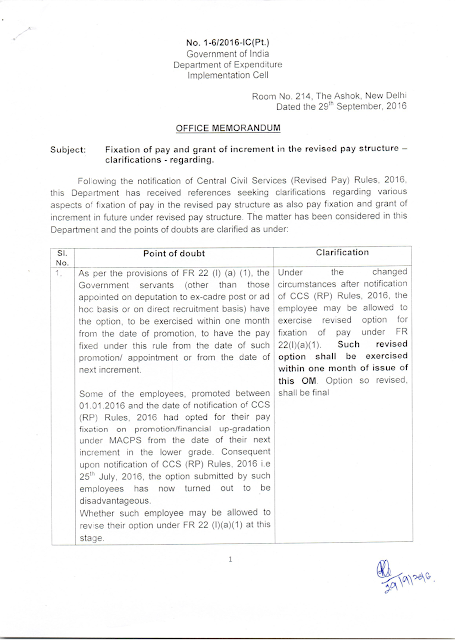 But an employee or worker who serves for 35 to 40 years and plays his role properly in developing national wealth is denied pension by the government. The government is gloating over the development rate and claiming credit for it exclusively. It is arguing that the growth rate of the country is the highest when compared with other nations and that fact underlines the necessity of implementing their present policies at a faster pace. However, it is completely depending on the Rain God for the development rate to increase from the present level of 7.6% to 8%. Whatever may be the growth rate of national economy, the statics of the government itself show that the growth rate of employment generation is a meager 1.7%. Even during the period from 2004-05 to 2009-10 when the growth rate was between 8% and 9% the increase in rate of employment was only 0.8%. Every year about one crore students who are anxious of getting an employment are passing out from colleges and universities. But according to Central Labour Board statistics only 1.5 lakh jobs were created last year. The people and the working class are questioning the usefulness of economic development that does not lead to proportionate increase in employment potential. The corporate sector is asserting that the employment opportunities diminish to the extent of induction of technology and automation into different sectors of economy. The working class is demanding a human resource oriented progress in a country of about 125 crore population. A report of the National Sample Survey Organization of the Union Government revealed, on the other hand, that the economic reforms have brought down the purchasing power of the people and so the nutrition values of their food are also on the decrease. Dr. Akroyd formula stipulates that an adult should consume a diet of 2,700 calories value per day. But the percentage of population that is consuming less than 2,700 calories has gone up from 58.52% in 1993-94 to 68% in 2011-12. This precisely is the development that was brought about by the reforms. Over and above all the foregoing, the Modi Government is showing a scant respect to the laws of the nation. When 10 central trade unions and more than 40 independent federations served a statutory notice for strike, the government, instead of holding discussions with them, held talks with B.M.S., an R.S.S. affiliate and a pro-B.J.P. organization which was against the strike, with the sole intention of thwarting the struggle. This N.D.A. Government came to power by promising the people a rule quite different from that of its predecessors and unearthing black money which amounts to about Rs.10 lakhs per head. But after coming to power it began to hoodwink them and stand in support of corporates and exploiters. The 2nd September strike took place to remind the government that it is on a contract only for a period of five years and to warn that it would be shown the door in 2019 if it goes ahead with its anti-people, anti-working class and pro-capitalist policies. 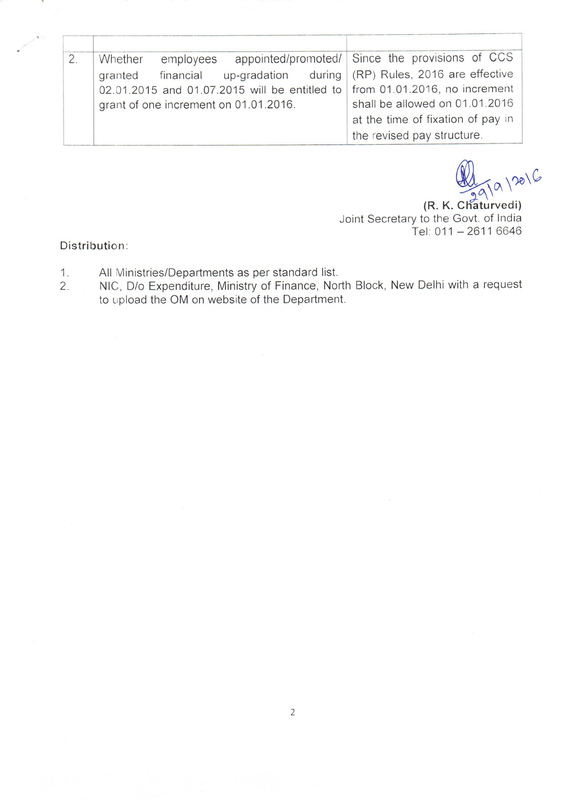 The heat generated by this strike compelled the sub-committee of ministers to hastily announce some sops. Important among them is an improvement in the minimum wage. The daily wage of a 'C' category labourer was enhanced from the present Rs.246/- to Rs.350/-. That amounts to about Rs.9,100/- per month. But some of the state governments are already giving a minimum wage of more than Rs.10,000/- per month. The minimum wage announced by the central government is miles away from Rs.18,000/- which are being demanded by the working class. The statement of the government that 7 out of 12 demands were settled is nothing other than a falsehood. What, the demands of the workers of Anganwadi, mid-day meal and unorganized sector could elicit from the government are mere assurances and not concrete proposals. The statement of the Finance Minister that the bank employees have nothing to do with bank merger proposals is highly objectionable. In the background of international economy still being haunted by the 2008 debacle of the biggest bank in U.S.A. the pronouncements of our Finance Minister, a Corporate Lawyer, that bigger banks will give a boost to the economy are unwise and bereft of reason. Whereas the B.J.P. Government at the center enhanced the ceiling limit on bonus the state governments belonging to the same party approached respective High Courts and obtained stay orders on center’s decision. If the center goes on an appeal to the Supreme Court the B.J.P. state governments will argue against it. The working class of the country should understand this pseudo fight between the center and some states. However, that class is not ready to accept the devious methods that are being adopted by the central government in making amendments to laws through executive orders instead of a parliamentary process. In this background the strike of 2nd September,2016 should be considered as a warning to Modi Government to desist from its anti-people and anti-labour policies. Otherwise the working class of the country will be compelled to wage more bigger and unified struggles in the direction of changing the government. RED SALUTE TO ALL THOSE WHO MADE THE 2nd SEPTEMBER STRIKE A HUGE SUCCESS.